First there were modern-day yurts, then luxury ‘glamping’ and now there is a new spin on traditional camping in the form of beach ‘pods’ made from recycled plastic waste. 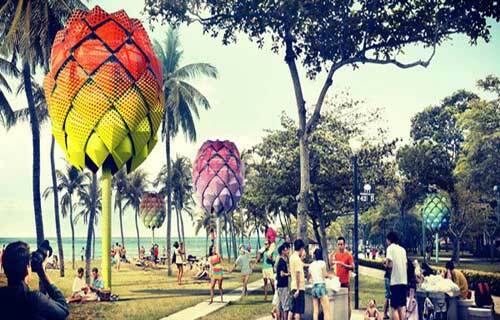 The pods are the vision of architectural design company, Spark, whose founder, Stephen Pimbley, was inspired by recent campaigns by adidas and G-Star RAW to produce new products using plastic waste collected from the seas and oceans. 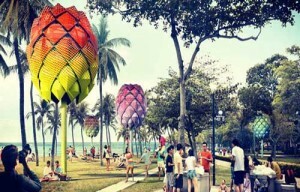 Spark wants to use HDPE collected from the South Pacific Garbage Patch, a collection of marine debris in the South Pacific waters, to produce brightly coloured, pine cone-shaped huts for beaches in Singapore. The plastic would be colour-sorted and shredded before being mixed with recycled glass and moulded into ‘tiles’ to clad the timber inner frames of the huts, which are elevated from the ground by concrete stems. The huts are powered by solar energy and feature an interior fan to keep overnight guests cool. The plastics industry is committed to the fight against ocean waste, with an upcoming key conference dedicated to alleviating the problem. The ‘PolyTalk’ conference, organised by European trade association, PlasticsEurope, will present a two-day event entitled ‘Zero Plastics to the Oceans’, which will take place on 16 and 17 March at the Egg Congress and Meeting Centre in Brussels. PolyTalk 2016 will gather delegates from European and national policy and decision makers, representatives of non-governmental organisations, brand owners, designers, civil society and the plastics industry to open a constructive, multi-stakeholder dialogue on solutions to marine litter.